A monster game from QB Philip Rivers and WR Keenan Allen carried the Los Angeles Chargers to a 28-6 Thanksgiving afternoon win over the Dallas Cowboys Thursday, in a game where the Chargers never had to punt. 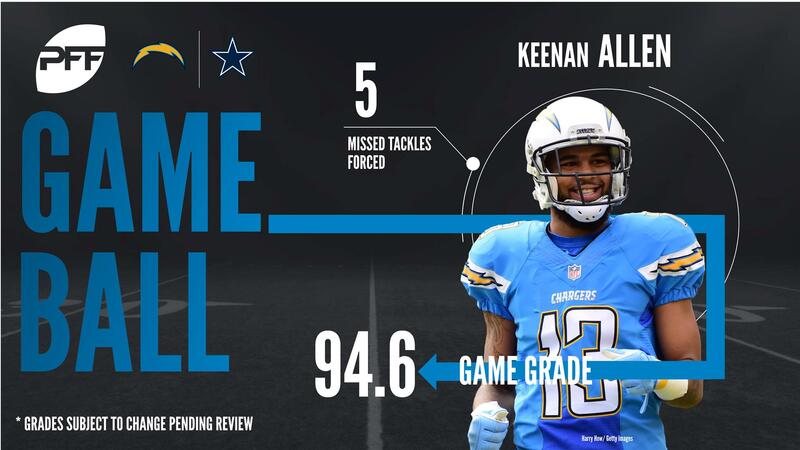 The game brought both teams to a 5-6 record, with the Chargers getting receiving touchdowns from Allen, Tyrell Williams, and Hunter Henry, and an interception return score from Desmond King. The Cowboys couldn’t get much going on offense all game long, managing a lone third-quarter score on a short run by Rod Smith. That couldn’t have gone much better. Rivers was surgical in his dissection of the Cowboys defense, throwing just six incompletions (one of which was a drop) while still being able to work down the field. It’s telling that of his 27 completions, 11 of those went on throws that went 10 yards in the air or more. It didn’t really matter what the Cowboys did, but they were particularly exposed when they didn’t blitz. There, Rivers walked away with the perfect 158.3 QB rating. It was like watching a man go up against a group of boys as Allen had his way with the Cowboys secondary, with Anthony Brown in particular having a day he’d much rather forget. We’ll be watching Allen’s slaloming touchdown run for a long time to come as five Cowboys defenders had a shot at bringing him down on a single play, and five Cowboys defenders missed as he broke ankles on his way to the end zone. Allen has lit it up the past two weeks and is looking as good as he has ever looked, bad news for anyone tasked with covering him. It remains a mystery how Hayward was allowed to leave Green Bay and that there wasn’t a bigger market for his services. Stigmatized perhaps as just a slot corner, he’s proven himself more than able outside where he had another stellar game. Outside of being called for a flag early, it pretty much all went his way as he comfortably won his match up with Dez Bryant. All in all he was thrown at seven times, allowing three completions for just 22 yards while breaking up one pass and intercepting another. Another unheralded Charger, Addae is quietly putting together the best season of his career. He’s one of the new breed of safeties that look like they belong in the box, and he has a very useful habit of being able to get very low to beat blocks of bigger lineman when they try to get their hands on him. The former undrafted free agent has followed up his solid and then some 2016, with increased production on a heavier workload. The 97.9 percent of defensive snaps he’s featured on represents a career best. For most of the game it was perfectly serviceable from Prescott without really challenging a Chargers defense that was happy to match up with his receivers. Then late in the game when time was against them, the Cowboys quarterback got sloppy and was picked off twice in quick succession in a five-minute stretch that summed up where the Dallas season is heading. The protection was much improved (his linemen combined to give up just 10 total hurries) so the excuses are starting to run out for a guy who is enduring his roughest stretch as a pro quarterback. With the excellent Zack Martin forced from the game, it was time for another backup to fill in along the line and Looney promptly led the team in hurries allowed with four on his 26 pass-blocking snaps. It wasn’t all bad and he was far from the liability that Chaz Green was when inserted into the lineup, but with another injury along the offensive line you start to wonder if the Cowboys 2017 season is doomed. If there was a big bright spot for Dallas, it was the efforts of Smith, who tends to look much better when playing about half the teams defensive snaps (38 out of 68 here). He might not jump out on tape like he did at Notre Dame, but he did pick up three defensive stops while adding his second pass break up of the season. Given all he’s gone through to get here, to be playing as well as he is should not be overlooked. There aren’t a whole lot of positives to write about the Dallas defense and so it’s worth pointing out a performance that failed to stand out. The Chargers did a good job slowing down Lawrence who finished the day with just three hurries. After his hot start to the year things have tailed off in recent weeks and he now has just nine combined sacks, hits and hurries over his last three games. If Dallas are to salvage this season those numbers need to shoot up.